I recently learned about baked oatmeal - and I'm hooked. I WANT to like oatmeal, I really do, but it's just so slimy and goopy. John's so good about eating it, but I just can't seem to get into it. It's a texture thing. Which is why baked oatmeal is so good! It has a crispy top and warm soft inside - more like a cookie than goo. Like eating Christmas, to one blogger. (Can prepare the night before) heat oven to 350, bake for 40 minutes. Put under broiler for the last two minutes if desired, serve with milk! I'm feeling a little guilty about the sugar content and may try less next time, for L's sake. You could also toss in any of the stuff you might normally add to your oatmeal: nuts, bacon, blueberries - go for it! As an anti-oatmealite, that picture is not reassuring. Someone was talking about baked oatmeal just the other day and I thought it sounded good. She said it tasted like those cereal bars you can buy, only better. I was thinking of trying the recipe. Apparently I will not be feeding them to my husband. yeah, it's like an oatmeal cookie. Louise loves it, Josh probably would, too. 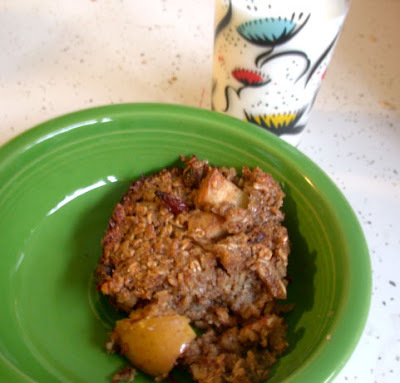 i like reg oatmeal (with plenty of brown sugar, honey, and cinammon) but had it baked this summer for the first time. it was great. I wanted you to know that I made the oatmeal and substituted the syrup with organic applesauce (wet ingredient for wet ingredient) and it worked really well. Also I'm tryin got make some with Jonah's oatmeal Cereal (he won't eat it anymore) and I'll let you know how it comes out. I'm halfing the recipe since Jonah doesn't eat alot of solid food right now. If he hates it I won't be wasting a lot of time.